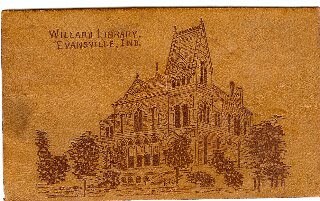 John, this leather post card depicting Willard Library may not be that unusual but I found it unique and thought I'd share it with you. It was post marked Evansville, Ind. 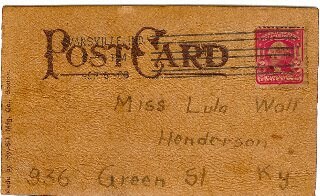 06 Sep 1909, and sent to my maternal grandmother in Henderson, Kentucky by one of her suitors at that time. She eventually married Herman Klauder Kreipke in 1911 and they had two children, one being my mother, Minnie Louise (Kreipke) Crane.